How To Guide/ Tutorials for Everything. When you leave your job, you must remember to send a goodbye resignation email to coworkers, this will not only improve your relations with them but also end the part of your life with a happy note. The people you work with are an important part of your network, and this network must be improved as much as possible. Your colleagues might be able to help you with your career in some way, such as providing you with a reference, offering you some job leads for when your searching, or introducing you to some influential people to enhance your network. 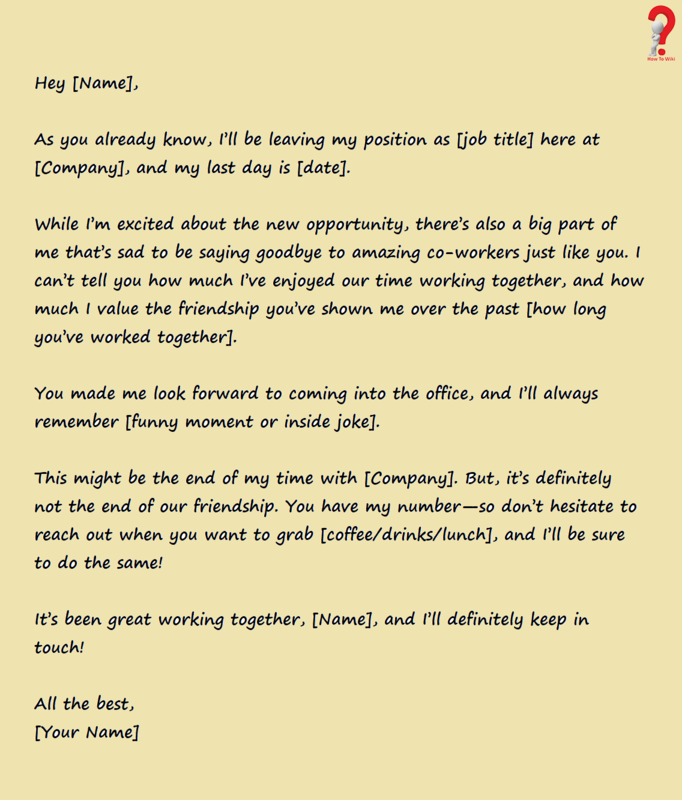 Writing a resignation email to coworkers, saying goodbye, is simply the polite things to do. Whatever may be the reason for you to leave, you must leave on a professional note. Pointer #1 It is best to send the emails before you leave, not after. The best time to send your email is when you have finished most of your work tasks, probably two or three days before you leave. Pointer #2 The more personalized the letter the better, you must write what is in your heart for them in the most polite way possible. Consider tailoring each email separately for the individual person rather than sending out a mass email. Pointer #3 Only send emails to those who you have worked with, especially those who work in MNC or a big company, you do not want to send messages to everyone. Pointer #4 Say Thank You! You may not get another chance to express gratitude for any help or mentorship provided, you must include a thank you in the email. you might also express how much fun you had while working with them. Pointer #5 You must always keep the email positive, do not add any unwanted and unnecessary emotions in them, and do not add any harsh comments as you do not wish to leave a bad impression on them. Pointer #6 Do not forget to include your Contact Information, as after you leave the office, they must have a way to contact you for any get-together they are planning, and to keep in touch with them for future references. Pointer #7 Keep it brief, no one likes to read a long and boring email, just send a few regards, add some personal message and send it to them with a happy note. 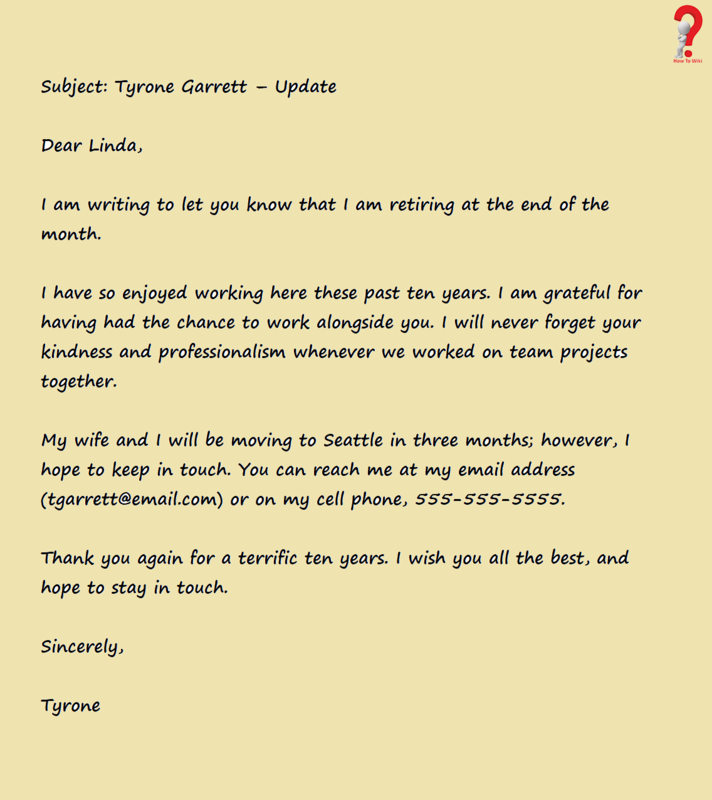 Pointer #8 Try using a sample letter, you can refer to a sample farewell/resignation letter for your colleagues to know how you can draft your own. Remember to personalize them. It is often a good idea to send your goodbyes via email, this will allow your colleagues to receive the message quickly. You can also send regards to individuals personally to everyone you want to keep in contact. Tip: When you send your farewell via email, do not forget to write your name and reason for writing in the subject line so they will instantly open and read that mail. We hope that you like what you read, please share our post if you did. For more posts like this, you can look at the right panel and see them there.